Advanced Spinal Rehabilitation specializes in the non-surgical treatment of low back injuries. Most specifically we treat disc herniation, disc bulges, degenerative disc disease and leg pain like sciatica that originates in the spine. As a result we have prevented hundreds of patients from going under the knife and ended their suffering without risk. In fact, we increase the health of the spine as opposed to cutting it open and weakening the area. In rare cases surgery is an appropriate treatment but that should be the exception as opposed to the rule. To give you some idea of the epidemic that is low back surgery more than 500,000 patients undergo lumbar spine surgery each year. About 150 thousand of those surgeries are spinal fusions. Unfortunately, 50% of all surgical patients will fail to gain their desired outcome. In fact, 10% of patients will be WORSE after the initial surgery. A Must Read for All Considering Back Surgery! Surgery is appropriate only for a select few. It is the opinion of the Advanced Spinal Rehabilitation that all alternatives to surgery should be attempted first. 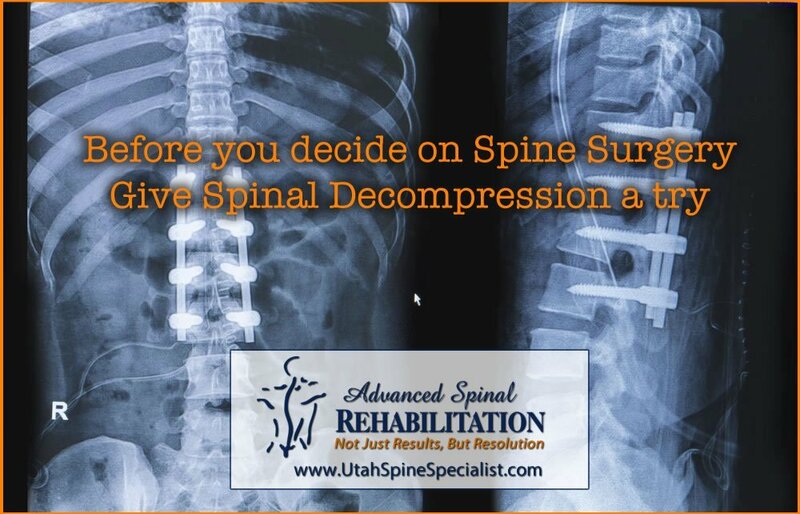 Please call to schedule time with a doctor and let’s find out if you are a candidate for our spinal decompression and rehabilitation program. Surgery should always be your last choice. As a result, the surgery can cause a new source of pain. Low back structures are physically close to one another, and because surgery in the lower spine is in itself stressful to the area, it can weaken and destabilize the area. Structures that have not been removed can become damaged or stressed as a result of the surgery and themselves become a new source for pain. Unfortunately this is unavoidable with surgery. All surgery, including low back surgery, is associated with infection risks. The risks begin preoperatively with the injection of anesthetics or other preparatory drugs and continue straight through the surgical procedure itself. The risk of infection remains throughout the postoperative recovery period whether that recovery occurs in hospital or out. If infection sets in, the infection itself can cause independent medical problems as well as become an independent source of pain. If nerve damage occurs, it can result in continued pain. Anesthesia is associated with a great number of medical risks. Low back surgery always requires the use of anesthesia and anesthesia itself is associated with a great number of medical risks including death. All surgery, including low back surgery, is associated with infection risks. ALL SURGERY, including low back surgery, is associated with infection risks. The risks begin preoperatively with the injection of anesthetics or other preparatory drugs and continue straight through the surgical procedure itself. Also with the postoperative recovery period whether that recovery occurs in hospital or out. Recovery time can be from 6 weeks to 15 months! Even if the surgery is successful in and of itself, problems actually develop – there is the high probability that within 2 to 5 years, another surgery will be needed to fix the level(s) above or below the ones from the first surgery. The sheer force of normal weight and gravity on the spine during the course of everyday life will result in the development of new problems and thus, new sources of pain. Surgery can destabilize and promote deconditioning.